With the media arriving bright and early (some as early as 6 a.m.) the press shuttles did a brisk business of departing to the event site every 30 minutes, beginning at 6:45 a.m. until 9:15 a.m., with final media access at 9:45 a.m. More than a few press wore a frown as security directed them to park their cars on a dirt lot located at the end of the road; a lot that by 8 a.m. was already over-crowded. It seemed that the entire Central Valley – and a good part of Los Angeles too – was waiting for our president, holding their breath. Unfortunates who arrived after 10 a.m. (many from the Los Angeles area) were either turned away by security or forced to park MANY miles away in downtown Keene and take a taxi back to the National Chavez Center in Villa La Paz. More frowns. Where: International Terminal at Meadows Field Airport; 1401 Skyway Drive, Bakersfield, CA. When: Monday, October 8, 2012, 9:45 a.m. The media were given a very narrow window of opportunity to address the president: from 8:30 a.m. – 8:45 a.m. Needless to say, this left many a newsman shaking their head in utter disgust, despite our president’s bright smile and easy charm, lol. 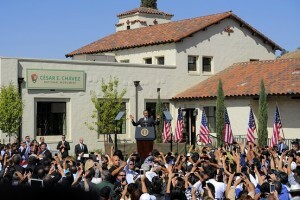 President Barack Obama addresses the crowd at the César E. Chávez National Monument ceremony. Photo courtesy of The Official Barack Obama Website. Copyright 2012. However, all the time and trouble proved to be well worth it when the president finally took the mic at approximately 11:15 a.m.
After his speech, President Obama-closely guarded on all sides by tight security-moved about the front of the crowd, smiling broadly and shaking hands as cameras both cheap and expensive snapped away from all directions. Shortly thereafter, he boarded his black helicopter and rose above the crowd, taking flight. 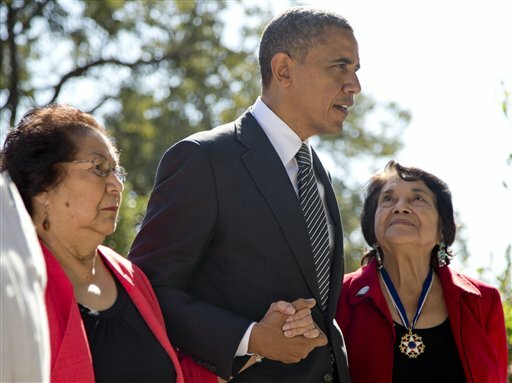 The widow of the late César Chávez spoke fondly of the private visit our president took with her earlier that day, to the grave site of her late husband, who is buried on the grounds of their home; a home that thanks to President Obama is now a designated National Monument. 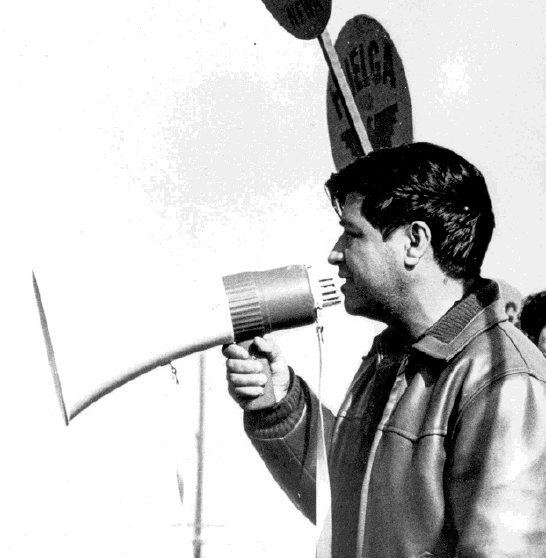 Widely recognized as the most important Latino leader in the United States during the twentieth century, César Chávez led farm workers and supporters in the establishment of the country’s first permanent agricultural union. His leadership brought sustained international attention to the plight of U.S. farm workers, and secured for them higher wages and safer working conditions. Photo courtesy of The National Park Service. Copyright 2012. But, unknown to the crowds below, our president had one more visit to make before arriving back at the International Terminal at Meadows Field Airport: the tiny farming town of Porterville, California and its nearby sister towns! Yes, with plenty of time to make it back to Air Force One (not slated to depart until 12:30 p.m.) our president decided to “take a cruise” through our farming communities that border the metropolitan city of Bakersfield. The Los Angeles Beat wishes to thank ‘Bakersfield Now’ for the use of their video of President Barack Obama’s complete, uncut speech for the establishment of the César E. Chávez National Monument in Keene, CA. Copyright 2012. No use or reproduction thereof without the permission of Bakersfield Now. 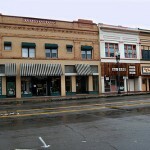 Main Street of downtown Porterville, CA. Photo courtesy of FlickrRiver. Copyright 2012. 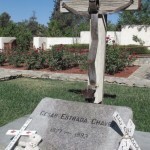 This entry was posted in Events, News & Sports and tagged Bakersfield, Barack Obama, César E. Chávez National Monument, Keene CA, National Chavez Center, Porterville. Bookmark the permalink.